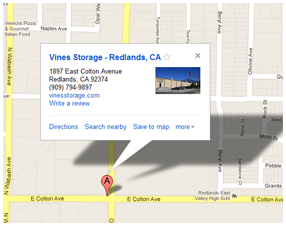 Redlands Storage for Cars: Why choose Redlands storage for cars and other valuable items? Why choose Redlands storage for cars and other valuable items? One of the reasons why people choose to store items like cars, antiques, or seasonal items is to create more room in the home. Keeping less-used items in the garage or attic accomplishes this goal, but may not preserve belongings in optimal condition, due to the fact that environmental conditions in such places may not be suitable for certain types of objects. Temperature and humidity can adversely affect computer equipment and other electronics, paper documents, photographs, vinyl records, artwork, and even clothing. Living in Redlands, finding storage for cars and other valuable items in which extreme heat or moisture is not an issue ensures their longevity. Develop discoloration, rust, or other forms of corrosion. While we may not experience extreme cold temperatures falling below zero in Southern California, there are often days that reach highs in the nineties and beyond, posing a threat to valuables stored in sheds, carports, or other locations more susceptible to environmental factors. When placing items that you will access throughout the year into a storage unit, an added benefit of an indoor facility is you will feel more comfortable during those times in which you are working in your unit, moving or reorganizing stored items. We offer storage units in various sizes, all within a safely monitored facility. Contact us for more information on our services. Who Can Benefit from Car Storage? Why Should You Rent a Garage for Your Classic Car? Are you looking for a spacious indoor car storage facility in Highland, CA? Look no further.